Minority rule undermines confidence in democracy. Photo credit: DonkeyHotey / WhoWhatWhy (CC BY-SA 2.0) See complete attribution below. Instead of doing some soul-searching about why they got their clocks cleaned in last month’s midterm elections, Republicans across the country, in their latest democracy-defying stunt, are trying to overturn the will of voters — at least those voters they hadn’t already managed to disenfranchise. It’s a pattern that should infuriate any American who cares at all about democracy. After their big win in 2010, Republicans redrew state maps to make sure there would not be fair congressional elections for at least a decade. After the Shelby County v. Holder Supreme Court decision in 2013, they passed a wide range of voter suppression laws to ensure there would not be any fair elections of any kind for as long as they were in charge. And now, after all that was not enough to prevent Democrats from winning the House and flipping some governorships in key states, the GOP unveiled its latest anti-democracy trick: In a move that is reminiscent of two-bit banana republic dictators, Republicans in multiple swing states are trying to strip the incoming Democratic officeholders of important powers by making last-minute changes to election laws. In Michigan, Democrats were elected governor, attorney general, and secretary of state. Worse yet for the GOP, voters approved a measure that would improve ballot access by allowing same-day voter registration up to Election Day. None of that is sitting well with Republicans, who are trying to pass a set of laws in this year’s lame-duck session that ignores the will of the people and would roll back some of these reforms. For example, they want to prevent same-day voter registration within two weeks of an election. They are also trying to curtail the powers of the incoming Democrats on a wide range of other issues. In Ohio, where the GOP held on to statewide offices, the problem for Republicans isn’t Democrats but rather that the state’s citizens want more democracy. Earlier this year, they approved a measure that will force the Buckeye State’s gerrymandered congressional map to be redrawn in 2021. Realizing that voters may use the same process to pass other reforms, Republicans are now trying to make it more difficult to amend the state constitution through ballot initiatives. In North Carolina, the GOP is trying to advance a bill in the lame duck that would ensure that Republicans control all of the state’s election boards in election years. The timing of that measure is particularly poor as it comes while a North Carolina Republican is accused of having engineered large-scale election fraud in the 9th congressional district. But they have to do it now because the GOP lost its supermajority in November, and want to be able to override a veto from the Democratic governor. And then there is Wisconsin, where Gov. Scott Walker (R), a champion of voter suppression, lost in November. As a result, Republicans this week passed measures that would strip power from the incoming Democratic governor, and also curb early voting. Even for somebody who gets paid to write, it is difficult to put into words how absolutely insidious and wrong all of this is. It violates every principle the US was founded on, and every single American should be seething about this injustice. One of the things that still sets the country apart from other democracies is that elections are held like clockwork and there is an uncontested transfer of power, no matter how close elections are. Republicans are now taking a sledgehammer to that tradition. Worst of all, because they have already succeeded in rigging the system to their advantage, the perpetrators of these crimes against democracy will get away with it. All of the aforementioned states are extremely gerrymandered. In Wisconsin, for example, Democratic candidates for the state assembly won 200,000 more votes (a total of 54 percent) but only 36 out of 99 seats. Democrats also won the popular votes in Michigan and North Carolina but are underrepresented in the state legislatures. With each step, these states move away from democracy and toward one-party rule, and it becomes more difficult for voters to do anything about it. But they must. Because with its rulings on campaign finance and Shelby County as well as the refusal to decide gerrymandering cases, the Supreme Court has already shown that it would rather undermine democracy than reinforce it. And the GOP is making it abundantly clear this week that it would rather destroy the fabric of the US than relinquish a smidgen of power. 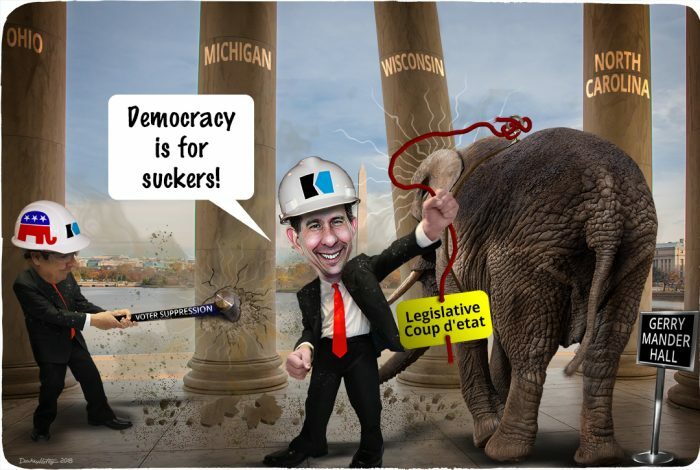 The cartoon above was created by DonkeyHotey for WhoWhatWhy from these images: Scott Walker caricature (DonkeyHotey / Flickr – CC BY 2.0), elephant (D Coetzee / Flickr), background (Bradley Weber / Flickr – CC BY 2.0), hard hat (Ted Murphy / Flickr – CC BY 2.0), and sledge hammer and hat (US Air Force).